A fresh look and excellent performance make the D-Link DSL-2890AL modem-router stand out from the crowd. You should consider it if you want fast wireless performance, including the ability to set up an 802.11ac network. It's also superb for streaming content to DLNA devices from attached USB storage devices. Forget about flat, rectangular-shaped modem-routers. A new shape has been embraced by D-Link and it's cylindrical. 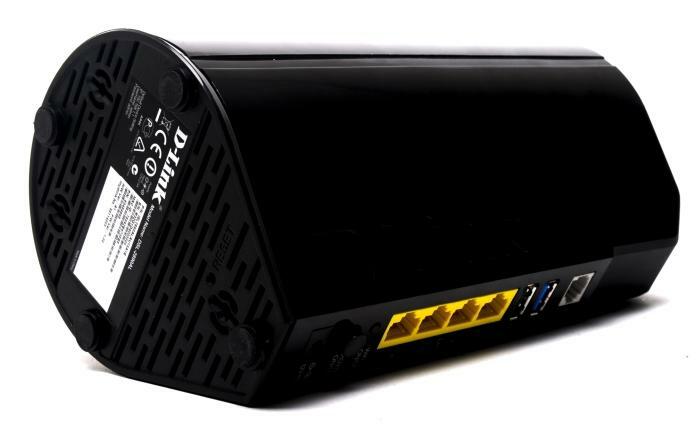 The company's DSL-2890AL modem-router immediately stands out because of its tall and round design, but it's also got plenty of good stuff within its casing. It's an 802.11ac router that can supply very fast and reliable wireless performance whether you use the new 802.11ac standard or just stick to 802.11n. Setting up this modem-router can be accomplished in one of two ways: if you know your way around, you can jump straight onto its Web interface and punch in your details manually, or you can use the supplied CD-ROM to set up and register the unit with D-Link's cloud service. The second method is the one that we used and it was a relatively straightforward process. 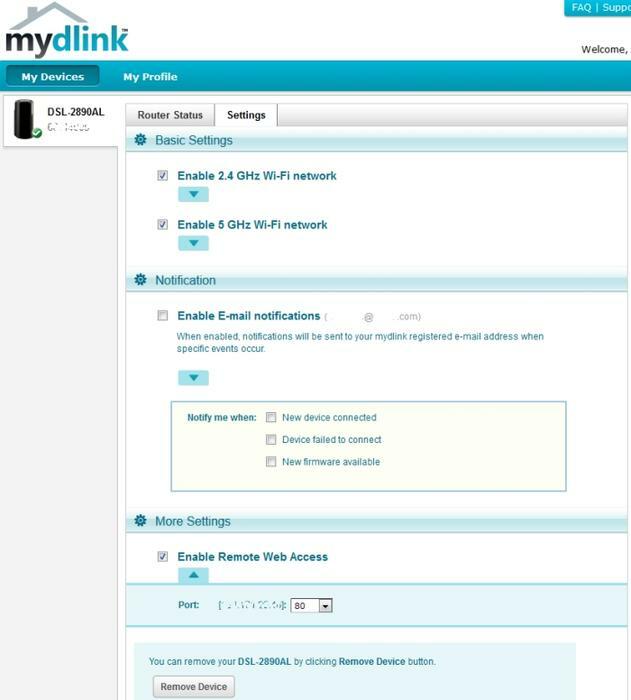 Apart from entering the ISP login details for your ADSL2+ account and then setting up your wireless networks, there is a step where you need to create an account for the MyDlink site and enter the unique code that can be found on your modem-router in order to register it. 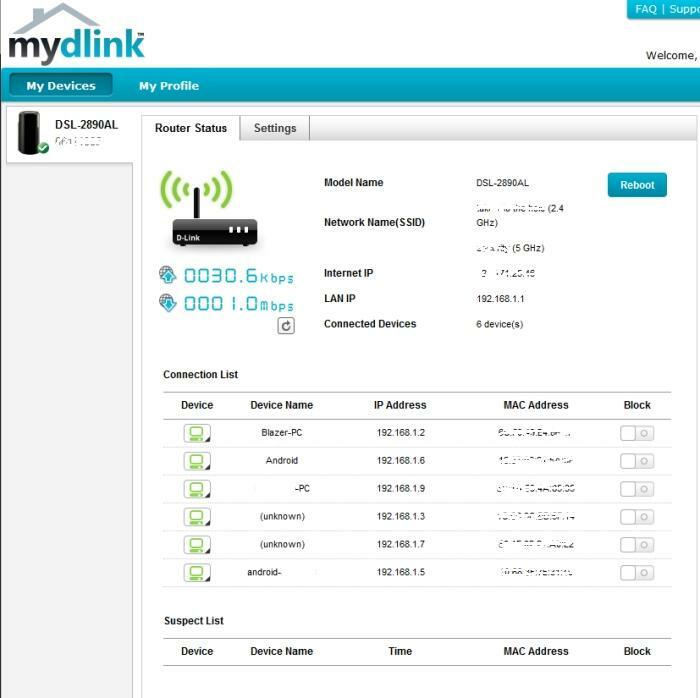 Once the modem-router is registered with the MyDlink cloud service, it can then be monitored remotely over the Internet and some of its functions can be controlled. Not all of the router's function become available the cloud, but you can keep tabs on which computers are connected to it, and you can view the recent Web history of those computers (good for parents who want to keep tabs on their kids from afar). Furthermore, the wireless networks can be disabled and enabled remotely through the cloud, and computers can even be blocked from the network. 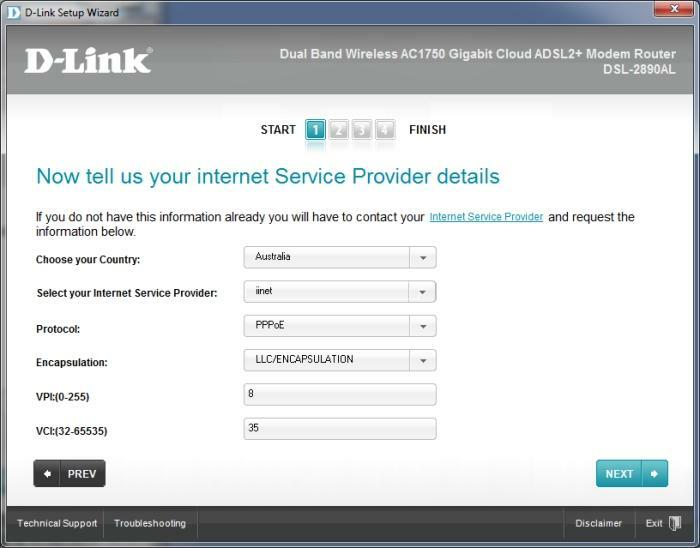 The CD set-up procedure is the one you need to use if you want to quickly register the router with D-Link's cloud service. Once your router is registered, you can monitor it remotely, and also do things such as set up email notifications when new devices connect to it. You can also see all the devices that are connected to it, view their recent Web history, and even block them. 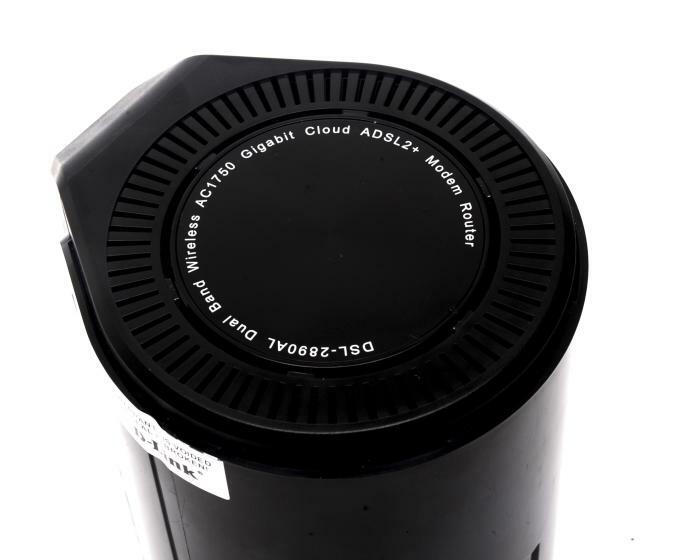 Physically, the tall, cylindrical shape of the DSL-2890AL offers a fresh perspective on how modem-routers should look, and while many who saw it said it resembled a coffee machine, we ended up liking the look of it a lot. The six antennas for the wireless network are all internal and all of the ports are located in a vertical strip at the back. It can be a little hard to manage all the cables in a vertical orientation, but a Velcro tie or two should do the trick. The top of the unit has ventilation holes, while the front of the unit has the status lights, which are yellow and orange, rather than blue, and therefore easy on the eyes. The only thing we don't like about the presentation of the router is the placement of its warranty tamper sticker, which is right at the top of the unit for all to see. Another quibble we have is with the length of cord for the power adapter. It's a little short, which could affect the placement of the unit, but on the upside, it's a neat little wall wart rather than a bulky power brick. This is unlike some of the other 802.11ac routers that we've tested, which have larger power bricks that can cause more of a cable mess than a simple wall wart transformer. The air vent at the top of the router. The router isn't designed to sit like this. As for the DSL-2890AL's wireless performance, we'll get straight to the point and let you know it's sensational. We tested it by transferring large video files from a server that was plugged into one of the router's Gigabit Ethernet ports, to a laptop that was equipped with an Intel Centrino Advanced-N 6300 wireless adapter. This dual-band adapter can support link speeds up to 450 megabits per second (Mbps) for the 5GHz network, and this is indeed the connection speed that was attained by the DSL-2890AL to this notebook. We transferred files over short-range (up to 2m) and mid-range (up to 10m) distances for both the 2.4GHz and 5GHz bands. Transfers over the 2.4GHz band were swift: the router got 14.5 megabytes per second (MBps) in the short-range test and 12.08MBps in the mid-range test. Its short-range result is even faster than what the super-quick WD MyNet Central N900 achieved in the same test. At 5GHz, the D-Link put up a rate of 21.96MBps in the short-range test and 14.9MBps in the mid-range test. The drop-off in speed was expected in the mid-range test for this band, but the results are still solid, and faster than similar routers such as Belkin's AC1200 and the ASUS DSL-N55U. Of course, the speeds you get with this router will vary depending on your environment and whether there is any interference present to hamper the signal, but compared to other routers in our standard test environment, the D-Link DSL-2890AL is one of the fastest we've seen when it comes to 2.4GHz and 5GHz 802.11n performance. We tested the D-Link's 802.11ac capability by running our test laptop with a Belkin AC Dual-Band USB Adapter, which can support a link speed up to 867Mbps. It's not an ideal match for the D-Link router, which can support 802.11ac link speeds up to 1300Mbps. Nevertheless, the D-Link supplied even faster 5GHz performance when paired with the Belkin adapter, averaging a rate of 24.16MBps in our short-range test, and an equally impressive 22.30MBps in the mid-range test. It's a noticeable speed bump for longer distance file transfers and, indeed, this is one of the benefits that 802.11ac is meant to supply: faster speeds over longer distances. We'll re-test this router and update this review with more speeds once we get D-Link's own 802.11ac adapters to test with. It's important to note that all of our tests are in practice and that they were reliable. The router never gave us varying speeds in our environment, nor did it ever drop out while we performed file transfers. It also proved to be a great unit for streaming video to DLNA devices. We had no issues at all when streaming standard-definition and high-definition files (720p and 1080p) across the 5GHz network to our LG TV. Furthermore, the USB storage ports on the router worked beautifully. When we viewed the contents of attached hard drives through our TV, there was barely any lag and we were able to go from folder to folder more quickly than we can remember doing so with any other router. Files streamed off the hard drive perfectly, and we could stream multiple files off the same drive simultaneously without any issues (one to the TV and another to a computer) using the 5GHz 802.11n network. We were also able to easily stream video to our Android phone (a Samsung Galaxy Note 2) using D-Link's SharePort Mobile app. File browsing was easy through this app and we were able to view videos through the video players that we had previously installed on our phone (such as MX Player). This aspect of our testing wasn't always reliable though, with videos sometimes conking out halfway through the stream. The other functions of the D-Link DSL-2890AL are typical. You can do things such as forward ports and use dynamic DNS services, you can enable QoS, you can set up guest Wi-Fi access and use Wi-Fi Protected Setup, and there is a built-in SPI firewall. You can also implement keyword filters to block sites and topics that you don't want kids to see. (Sites with flagged keywords in the URL just end up timing out). The keyword filters need to be enabled in a few parts, though: you need to enable the filter, then you need to enable access control, which requires a reboot, then you need to apply the access control to the PCs you wish to monitor and block. Luckily, this router reboots relatively quickly (in just over 1min), and its interface is very responsive. Overall, a fresh look and excellent performance make the D-Link DSL-2890AL an exciting product. It's a great modem-router to choose if you're after fast wireless performance now, and faster wireless performance later, once 802.11ac becomes prominent in client devices. You can reap the benefits of faster Wi-Fi performance over longer distances now, but only if you equip your computers and devices with 802.11ac USB adapters. Apart from the fast wireless performance, the overall reliability of this unit as a modem and a router was very good and we also found it to be quite easy to set up and use. There are some aspects of the interface that we'd change, such as the keyword filtering implementation, and we're hoping D-Link fixes the automatic firmware checking feature, which didn't work at all on our test router. The fact remains though, if you want an all-in-one modem and router unit that can provide fast wireless performance and painless media sharing from attached hard drives, it's hard to pass on the DSL-2890AL.